On the south coast, Chelsea took their revenge for a 1-0 home defeat in December by defeating Bournemouth in a closer contest. Manchester City moved up to third in the Premier League on Saturday while Newcastle United boosted their hopes of survival by coming back from two goals down at Liverpool to draw 2-2 and secure a precious point. On an afternoon that reaped 19 goals from four matches, last season’s Player of the Year Eden Hazard finally opened his league account for the season with two in Chelsea’s 4-1 win at Bournemouth. Manchester City’s bid for a top-three finish picked up extra momentum, a 4-0 demolition of Stoke City at the Etihad Stadium lifting them a point clear of fourth-placed Arsenal with 64 points from 35 matches. Nigerian striker Kelechi Iheanacho, 19, scored in the 64th and 74th minutes and was brought down for the penalty in the 43rd from which Sergio Aguero netted his 16th goal in as many games in all competitions this year. Fernando headed City’s opener from Jesus Navas’ 35th-minute corner. Leaders Leicester City, who have 73 points from 34 games, host Swansea City on Sunday while Arsenal travel to third from bottom Sunderland. Second-placed Tottenham Hotspur, on 68, entertain West Bromwich Albion on Monday. Liverpool stayed seventh in the table after their 2-2 draw at Anfield which marked the return of former manager Rafa Benitez with a combative Newcastle side. The match was overshadowed by the news that Liverpool’s French defender Mamadou Sakho had failed a dope test. Benitez, who managed Liverpool for six years and won the Champions League with them in 2005 when they came back from 3-0 down against AC Milan to draw 3-3 and win on penalties, had another rollercoaster afternoon. Daniel Sturridge put Liverpool ahead after 76 seconds and it was 2-0 on the half-hour when Adam Lallana scored the second but Newcastle rallied after the break through Papiss Cisse and Jack Colback to clinch their first away point of 2016. Second from bottom Newcastle are level on 30 points with Sunderland, who have two games in hand, and one behind Norwich City. Aston Villa, who have already been relegated, lost 4-2 to visiting Southampton as they slumped to a 10th defeat in a row. On the south coast, Chelsea took their revenge for a 1-0 home defeat in December by defeating Bournemouth in a closer contest than the scoreline suggested. 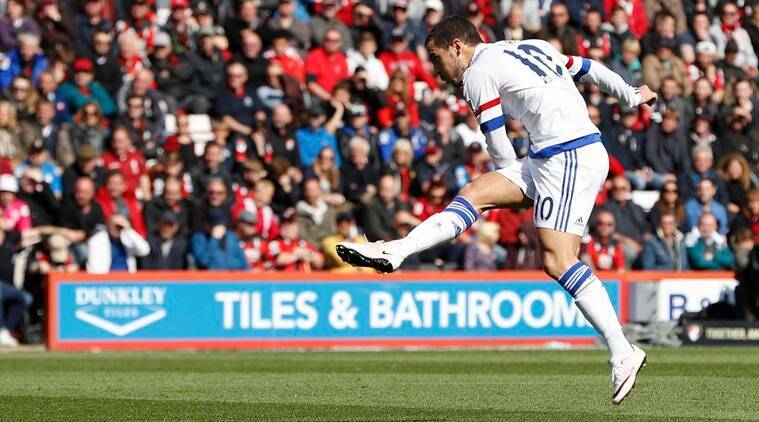 Hazard, who had not scored in the league for 29 games and 356 days, was on target in the 34th and 91st minutes. Cesc Fabregas set up three of the goals, with Spain forward Pedro opening Chelsea’s account in the fifth minute and Brazil midfielder Willian notching their third.